Instruments are often inseparable from the artists that use them. Their shapely contours and placid tones are identifiable characteristics for both the artist's expression and for the brand or maker of each particular instrument. Each individual musical implement is a tangible representation for a particular artist's outward soul expression. Over time these instruments will gain an aura, a certain mysticism commensurate with the personality aspects of its user. Today's rant from the 'rock room' will focus on a famed disseminate of rock riffs.... Jimmy Page's 1961 Danelectro 3021 guitar. Mr. Page's arsenal of guitars could very well be the most impressive in rock. His astonishing instrument vault, which was briefly witnessed in the rock documentary, 'It Might Get Loud' is stacked with 'Telecasters', 'Stratocasters', acoustic guitars and of course 'Les Paul's'. In addition to Page's numerous guitars sit a Hurdy Gurdy as well as Sitars, Theremins and plentiful electronic wizardry and amplification. 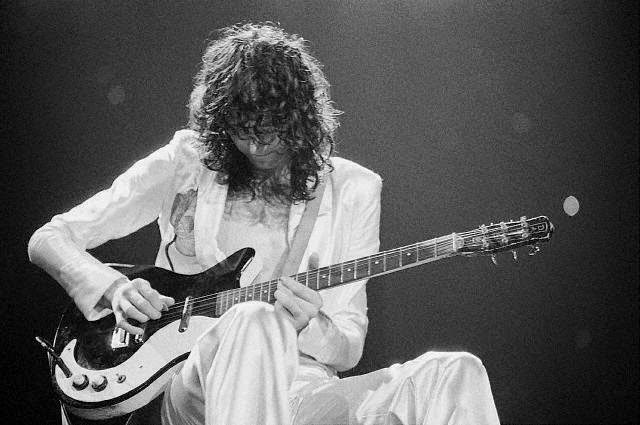 The guitar put under the 'rock room' microscope is an unassuming budget guitar that in Jimmy Page's hands became a tool of screaming argentate resonance. The 'budget' double cutaway Danelectro guitar became the destructive instrument of choice for Page when playing in alternate tunings as well as when playing slide guitar. 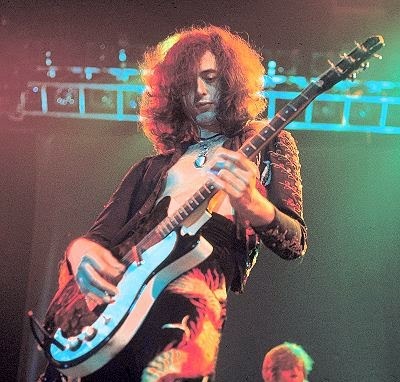 Page allegedly gained possession of the 1961 Danelectro 3021 guitar from the 'Selmer Showroom' in downtown London date unknown. The first documentation of him playing the guitar comes from a photo dated from 1965 where he is seated at a studio session with it. The 'shorthorn' guitar contains a masonite body, two plated 'lipstick' pickups, a white waved pick guard, tone and volume knobs and pick up selector. The guitar was available in mail order catalogs at the time, so during the era of Page's mid 1960's use it was by no means a 'rare' instrument. 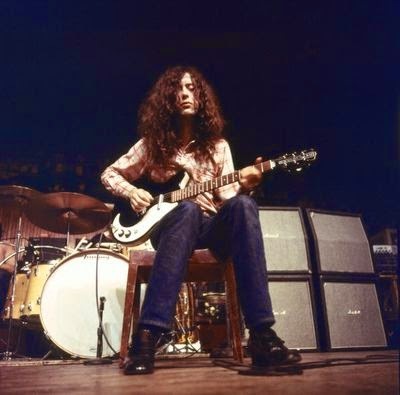 But inside the body of the guitar resided a chiming 'silvertone' if you will, a crisp treble that in the hands of a player such as Page' shot sonic streaks across numerous stages. Used on famed tracks such as 'White Summer'/Black Mountain Side', the guitar sounds as if it is transmitting as an alien transistor radio precariously balanced on a sharp cliff of a Himalayan peak. Scratching and over driven tones abound. Page often used the Celtic modal tuning of DADGAD, where the first, second and sixth strings are tuned down a full step. Page's exploratory and exotic riffing sounds sonically disturbed when passed through the internal electronics of the 3021 in unique tunings. The officially released footage of Led Zeppelin at the Royal Albert Hall in 1970 is a priceless document of Page and the instrument in action and is included in this review below. The guitar was used on stage as early as 1968 when Page was still a member of the Yardbirds, on their version of 'White Summer' hailing from the Little Games LP. It would continue to be used until Led Zeppelin's final European tour in 1980 and even made an appearance in 1988 (Atlantic Records 40th) and 2008 (It Might Get Loud) respectively. Similarly to 'White Summer/Black Mountain Side' the other tracks which featured the Danelectro in studio and on stage also found the instrument being tuned to the previously mentioned alternate tuning. 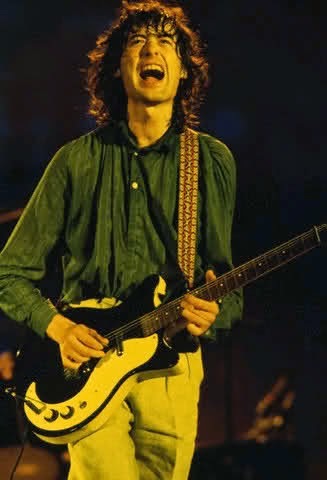 The rare appearances of 'When the Levee Breaks' during the 1975 tour featured the 3021 with Page's gravelly slide coaxing deep blusey melody's from its rosewood fingerboard. During the same era the guitar became the permanent instrument for additional concert staples, 'In My Time of Dying' and the legendary 'Kashmir'. 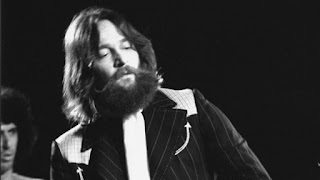 The substantial neck appears thick in photographs, which is perhaps why Page also preferred to play bumpy slide guitar in live performance on the piece. From other players comments on Danelectro guitars and from witnessing Page play the instrument, it appears that the guitars idiosyncrasy's are also its greatest asset. The qualities that originally made it a 'budget' buy have made it bargain for later day guitarists. It fires of sonorous tones and bleeds rough and ragged soul. The brand has continued to thrive right up through present times obviously due to Page's playing of the instrument as well as other respected players such as Peter Buck, R.L. Burnside, Jeff Beck, Nels Cline and a host of others donning their own Danelectro guitars. But it was Page, in all of his dark, demonic and revolutionary glory, conforming the instrument to his needs while using it to propagate his guitar creations. Check out the clip included below from It Might Get Loud, of Page revisiting a battered and war worn old friend for a bit of give and take. I posted your article to a couple Danelectro pages on facebook & couldn't recall whether I'd given you the heads up about this one response. November 12, 2014 at 12:33pm · Unlike · 2"